An article I wrote for ProfHacker at the Chronicle of Higher Education about using NodeXL for social network analysis came out yesterday. This is the first article in a two-part series introducing academics to how one might begin evaluating his or her own online, scholarly social network. In the first entry, I gesture to the ways in which social media network analysis in general and NodeXL in particular presents scholars with rich opportunities to learn more about the shape their participation in social media takes. 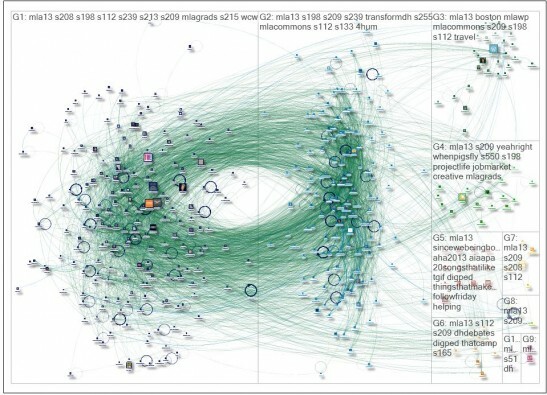 The second post, to be published Thursday, March 28, focuses more specifically on how NodeXL helps us make sense of conference backchannel conversation, taking as my example this year’s Twitter feed from the MLA 2013 convention. In the weeks ahead, I plan to write short tutorials for scholars on how to use NodeXL to better understand their use of social media for scholarly communication. My hope is that more academics take the time to evaluate their scholarly networks and that the activity sparks more conversation about how social media participation could or should be considered as a contribution to scholarship and to consider how social media can be used to expand one’s scholarly audience.